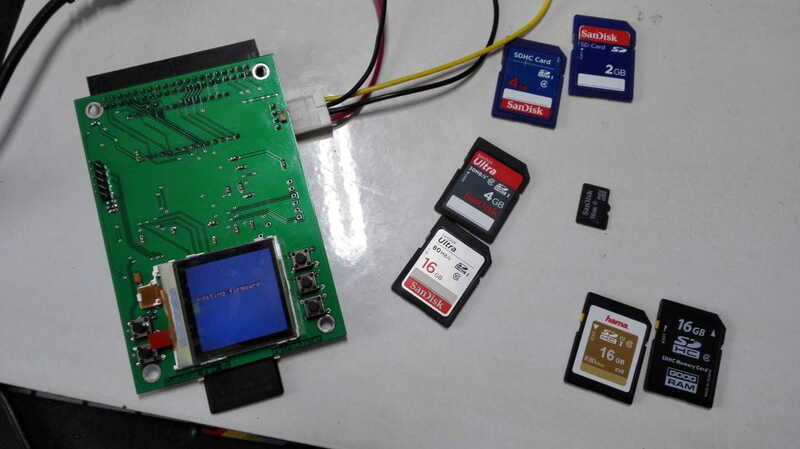 Chema: I recommend you to dump your SD card and analyse the output in a hexeditor. FAT16 structure are quite well documented, I suspect that the code/your code try to use some value hardcoded when the fat formating is not "reliable" on where things are. (On a previous project, there were some code that was searching for the first FAT block in a partition to use it, which was absolutely false because due to the way FAT is formated, the FAT sector could be at multiple places, due to this the code was using an invalid FAT sector and was listing file that does not exist. Indeed, Godzil. You're right about this. And that is what I tried to do. However at some places I still had to hack a bit (could not manage to follow the official ways). I dumped the card into a file and wrote a test program, there is where I make my tests. However I forgot about trying to read more than one sector When I saw it readed the first bytes correctly I thought it as working. How do you search for the FAT block? it may move, I think the bootblock give an hint on where to search it. I strongly suspect that the Windows formater and the other one you used does not use the same parameter for formating, or block size and this led to some important structure not beeing at the same place. Yep Godzil. The FAT driver in Cumulus is really not complete and does not seem to handle all cases, though it seems to try by looking at the code. I reached a point where my modified FAT code works reading files on an SD card with FAT16 and MBR as well as SDHC FAT32 with MBR cards (using images), but Cumulus fails. Probably I am not replicating the sequence of calls correctly, but I really fear this is not the problem now. More testing is needed, again trying to follow the sequence of actions and errors, which is something not easy when the code you want to test is the one interfacing with the SD card using the SPI interface. This requires using the cumulus itself and is a bit tedious and time-consuming. Not sure if I will go further or not. I have learned a lot of things in the process but I am not sure if it is worth the effort, to be honest. It is source code which can be adapted to any microcontroller using SPI interface with an SD/MMC card and seems to support well any type of FAT or card. But it is not a simple patch of the firmware. It needs a lot of code rewrite. Chema: you should try to test the Petit version of FatFS, the few needed function to make should already exist in the cumulus in a similar form. It should work with partitioned and non partitioned SD card (taking only the first one) and FAT16/32 filesystem. If the Petit version work correctly, we may evaluate the need to use the complete version, I'm not sure this is really needed because the only function that could be useful is the file create, but I'm not really certain that this would be a really interesting feature..
What we need is all the 4 commandm read, dir, lseek and write, and we should at least support FAT16 and FAT32. Tell me if you need help, or you don't have time to test this, you can make a simple layer between currently used fat functions and the Petit FatFS function for managing the FAT so that you won't have too much change to do. I saw the Petit version but I am not sure it is easy (or even possible) to adapt it, because I think the firmware expects to be able to keep several files open at the same time (not as the PetitFS version). I will try to dig in a bit more on this, but to be honest I am not sure if I will have the time and if it is of any interest. After all people are using SDHC cards without problems and it seems there is not a real demand for SD card support anymore. Oh! I forgot that we had to support 4 floppy at the same time..
Hello all ,thanks for add and sorry about my poor english. I know, it is really old topic but i have problem with Cumulus and i hope somebody here can help me. I do few Cumulus boards for friends but i'm stuck on bootloader . With some issues i'm finally compile it and load to cumulus but when i try update from SD card CUMULUS.BIN file, is hanging on start. I try lot of diffrent SDHC memory cards without sukcess. Any clue? Software what i use: MPLAB x 3.65 , C18 compiler 4.47 , Pickit 2. Attached is my compiled version of the PIC firmware - it's for S1D15G10 display and it works fine for me. Hi thanks. But i need bootloader first And here is my problem, bootloader what i have , cannot load BIN file from memory card. I try 8 diffrent cards. Also my Cumulus use PCF8833 display. I was read all topics here, http://forum.defence-force.org/viewtopi ... &start=120 , is similiar problem. How to resolve it? 2. Dirty hack - just remove or comment above lines and recompile source for your display. Again, first i need compile working SD bootloader. I have brand new Cumulus with empty PIC. You talking about firmware. I worked a bit on the firmware and it was really picky with the card used and the way it is was formatted. The boot loader uses the same code, so maybe the problem lies there. Also, a stupid detail, be sure the file name of the bin file is all in caps. Farious formats and cards, also formatted by this formatter.Start and hanging.